In the elementary library program our major goal is to support teachers and students in their teaching and learning, while helping children develop an understanding and love of literature. Students in grades K-5 attend library class once each week where literature appreciation, information literacy skills and critical thinking are emphasized. In all libraries students are encouraged to check out reading materials that will challenge and interest them. Forty-five minute classes for students in grades 1-5 are taught by certified library media specialists while kindergarten students have a thirty minute class taught by the library teaching assistant. Fifth grade students use the library weekly on a flexible basis through collaboration between the media specialist and their classroom teacher usually surrounding a research project. 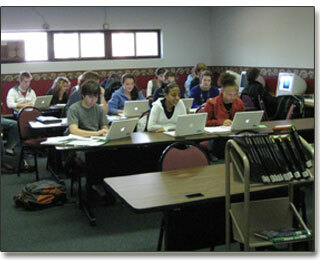 Although school library collections vary in size, all are appropriate for the population of their schools and include books, magazines, videos and audio books, as well as a combination of desktop and laptop computers that are available to students and staff for research and exploration. 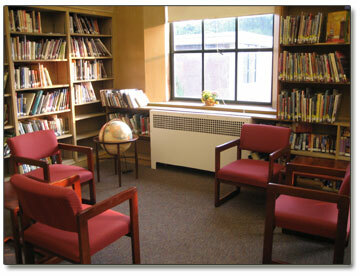 Many libraries house digital still and digital video cameras for in-school use by faculty and students. Curricular resources are purchased to support the core curriculum of the school and are often used by teachers to supplement textbooks in the classroom. There is also an emphasis on providing students with access to the most recently published quality literature for their independent and assigned reading. Students arrive in the fall of sixth grade with a love of reading and a strong foundation of information literacy skills they have learned in the elementary library media program. Although students do not have a regularly scheduled library class in middle school, they begin very soon to apply the research skills and knowledge learned in elementary school through teacher-directed research assignments. Through flexible scheduling and collaboration between the Library Media Specialist and classroom teachers, middle school students use our beautifully renovated library to find, evaluate and use information resources to answer questions and conduct research. In addition, students visit the library to choose books for outside reading projects. A major goal of the library media program is that students be able to select from a wide variety of materials those that most nearly suit their specific needs and graduate from eighth grade as independent, clear thinking and self motivated learners. What were formerly known as “library skills” are now believed to be simply “learning skills” that are common to every discipline and inseparable from classroom curricula needs. As certified teachers, Wellesley High School librarians assist students and teachers by developing a library collection that is aligned with the curriculum, collaborating with teachers, and creating a library environment conducive to learning. Although it is common for teachers to schedule just one or two class periods in the library, students then return on their own to seek individual assistance with using databases and print materials to continue their research.